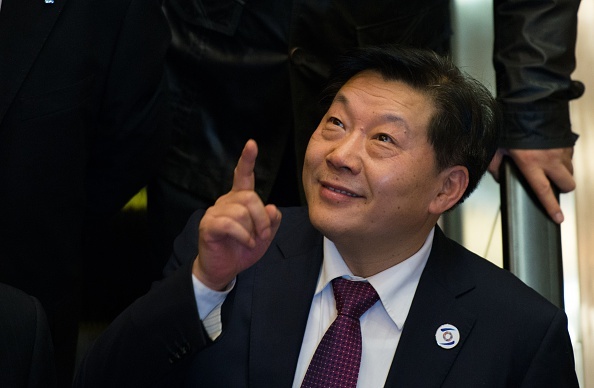 Lu Wei, former head of China’s Cyberspace Affairs Administration, gestures after giving a speech at the opening ceremony of the World Internet Conference in Wuzhen, in eastern China’s Zhejiang province, November 19, 2014. China’s Internet population is huge, at 700 million-plus users, yet only 52 percent of the overall population. It’s poised for yet more growth. But China’s Internet is also at the nexus of an extraordinary experiment: to see how great an extent cyberspace, that great tool for openness and connectedness, can also be used as a tool for control, for curation, and for autarky. Lu Wei was merely the face of China’s cyber control. Whether in his role as a Vice President of the state news agency Xinhua, or in his position as Vice Mayor of China’s capital, Beijing, or in his most recent roles as Deputy Director of the Propaganda Department and Director of the State Internet Information Office, he was the classic apparatchik: executing tough policies with gusto but without much apparent personal lofty strategic planning beyond the accumulation and use of power. It is possible that Lu’s ambition has now come back to bite him—certainly Lu has many enemies and many who have been offended by his manner and his actions over the years. That matters not to cyber policy—that was never personal to Lu. I think given all we have seen since the 18th Party Congress, China’s Internet policy has been—and will be—personal to Xi Jinping, an extension of his need for control, for caution, for personal trusted networks, and for nativism. In Xu Lin (Lu’s successor as Internet Czar), Xi Jinping has appointed someone he knows, he trusts, and he has worked with—someone who will make Internet policy even tighter and tougher. Tighter and tougher: these may not be words that intellectuals, journalists, or foreigners want to hear. But to Xi, they are vital. With the economy no longer powering automatic legitimacy to the Party, Xi needs to shore up the instruments of control to ensure that the natural discontents and grumblings that accompany slowdowns, layoffs, restructurings, and reforms stay quiet, stay disconnected, and stay confined. In happier economic times, the Internet was a useful escape valve for pressures and discontents, where commentators could trade jokes and barbs on Weibo and a cyberclass of discussion could swell up. To Xi’s eyes, the Internet brings only dangers and unwelcome influences. Much safer to control it, limit it, restrict it. The question is whether the strategy will work. My money is on yes, for the medium term. Those who need access to the world beyond the restricted Chinese Internet can still get at it through VPNs, though they too are often restricted and usually frustrating. Chinese Internet companies fill most needs for most users. Chinese language information and entertainment sites abound with content. Innovation and experimentation take place in a Chinese way within a Chinese world. That may not be ideal, but it is still a huge market and a growing one. The upcoming Wuzhen Internet Summit in November will be a chance for China to focus more on how to govern the Internet and to seek global allies. U.S. or European observers often forget that China is not alone in its fear of a free Internet. There are, of course, many in China who grumble about the restrictions—but they tend to be exactly the same people who grumble about the rest of the state of the country and Party anyway, so to Xi they can be easily dismissed. As long as Xi remains in power and remains convinced of the need for a top-down, controlled society, China’s Internet will be in his image—restricted, rule-based, and inward looking. Lu Wei has a backpfeifengesicht or “a face crying out for a slapping”— a German word recently popularized in America as a descriptor for Donald Trump. With any luck, we’ll see less of Lu’s oleaginous visage in the news media from now on. But aside from that, where’s China’s Internet headed after Lu departs his helmsman’s seat at the Cyberspace Administration of China? Same place it’s been headed for quite some time: It will remain a dynamic marketplace of ambitious entrepreneurs and world class engineers, used by hundreds of millions of digitally engaged citizens for a million purposes. China’s Internet also will continue to be censored, controlled, and restricted. Limits on free speech, activism, and anything the government does not like will get stricter and stricter, while the government funnels ever fatter budgets into increasingly slick propaganda. If it ain’t broke, don’t fix it, right? This year marked the quietest anniversary of Tiananmen yet in terms of online dissent and discussion. There is more censorship in general. More foreign websites are getting blocked. There is less circumvention because of a crackdown on circumvention tools. And fewer foreign companies are trying to challenge the status quo. We know controlling the medium is pretty near the top of Xi’s agenda. So why make a change now? I agree that during Lu Wei’s tenure the prospects for Internet freedom have gotten worse, not better. But Lu was not perfect. As we have shown, it is impossible to completely block all information for those inside China. Maybe in this regard, Lu was being blamed and Xi decided he wanted somebody who can get the job done. Maybe Xi was upset about being “vilified as a murder suspect” and could not comprehend why Lu Wei was unable to scrub such information from the Chinese Internet. The timing likely indicates that this was a planned and not a rash decision. There was no need to unsettle things before the June 4 anniversary and the change happens well before the next “World” Internet conference in Wuzhen. But the change may be more of an indication of how powerful Lu Wei has actually become as well as an indication of how powerful Xu Lin is going to be. Xi now puts his guy into place and can feel confident that Xu has his back. So if Xu Lin fails to quell “rumors and slander,” Xi does not have to second-guess whether or not Xu is doing everything within his power to stop these attacks. Under Xu, we’ll likely see an extreme strengthening of information control: harsher penalties for domestic Internet companies that let information slip through the cracks; the blocking of more foreign websites; disrupting encrypted communications channels; and fewer meetings with foreign Internet executives. CAC could also have more input on wider Internet-related issues including implementing stricter controls on foreign technology and encouraging and assisting domestic Internet and technology companies in their efforts to go global. Lu Wei surely presided over a period of Internet repression sufficiently effective to surprise and astonish Western experts and web evangelists who felt that the web’s decentralized architecture automatically militated against central control. And there’s no question Beijing has become increasingly savvy about wielding the tools of social media both to project its voice and to stifle others. But let’s remember that Lu Wei’s signal accomplishment—at least, as Xi Jinping would likely define it—is Lu’s use of fear and violence to quell public opinion, not his eloquence or his technocratic savvy. Lu’s chief insight, if it can charitably be called that, was that the communal ties between and among China’s “keyboard heroes” and “big Vs,” meaning influential Weibo bloggers, ultimately were no match for the state’s monopoly on violence. Starting in August 2013, after Lu organized an in-person sit-down with several big Vs, the Party began a campaign of arrest, detention, and prosecution directed at several influential micro-bloggers. Their backgrounds, like the charges against them, were diverse, with online hyperactivity the common red thread. Some of the targets were marched on television and made to confess, then thrown in prison. New rules made explicit that criminal prosecution would attend widely shared or read opinions posted contrary to the party line. And with that, as so often happens, violence trumped the word. Weibo rapidly began to shed its social influence as a public square, mostly in favor of WeChat, a mobile app that encourages far more siloed conversations. Beijing began to fill the resultant void with social media-friendly content of its own, and the tenor of nationwide discussion became more tinny and synthetic. Lu has since advanced a number of folksy similes to describe one of the most important and powerful inventions in human history. The Internet is a country with borders; or a house with guests; or a car that needs brakes. Whatever. Lu and Xi simply did what their predecessors were either unwilling or too disorganized to do: they consciously marshaled the machinery of violence against the online world. Web users in China now well know they risk their livelihoods and perhaps their physical freedom if they use the social internet to shape opinions that Beijing disfavors. The threat they face is corporeal and real. That is enough. Whither the Chinese Internet, now that Lu Wei has gone? And whither Lu himself? I may at some point be compelled to eat my hat on this one, but I’m not convinced, on the available evidence, that Lu’s departure is a demotion or indicates bigger trouble to come. As I’ve described in more detail here, I think he’s moving to his next position. The timing also fits rather well: Xu Lin was moved from the Shanghai Propaganda Department a year ago nearly to the day. A year to learn the ropes in preparation to take over, allowing Lu a good year in his new job, before the 19th Party Congress? Wherever Lu may go, his legacy is clear. But while most commentators have focused on Lu’s dealing with social media, I think there are at least two other major trends that occurred on his watch. First, the C.A.C. (originally the State Internet Information Office) was greatly expanded from an afterthought add-on of the State Council Information Office to a large coordinating unit directed by Xi personally (through the Central Leading Group for Cybersecurity and Informatization). On that trajectory, it took over important responsibilities from, amongst others, the Ministry of Industry and Information Technology, the Chinese Academy of Science (through the China Internet Network Information Center), and even the Central Propaganda Department. It stopped short of gaining strong responsibilities in the security area, as evidenced by Meng Jianzhu taking the lead on security discussions with the United States. Apart from that, its ascendancy was quite marked in the Chinese policy landscape. Moreover, the World Internet Conference, Lu’s brainchild is domestically considered as a great success. Second, Lu’s watch saw a notable shift in the Chinese government’s perception of the possibilities of the Internet, culminating in the “Internet Plus” agenda. It is no longer merely seen as a media tool, a platform for communication and association, but increasingly as an essential catalyst of social and economic development in just about all areas of life. The social credit system, for instance, will likely greatly expand the ways in which individual citizens are observed and evaluated. It would be going too far to say that Lu drove all of this, but he was certainly critical in creating the conditions for this new agenda. Moving forward, I believe we can expect more of the same, but in a more consolidated manner. Xi Jinping’s recent address at the National Work Conference for Cybersecurity and Informatization is the latest iteration of a consistent strand of policy rhetoric that combines strict control with strong state support for business development, and broad government intervention with entrepreneurialism. As the Internet plus agenda starts being implemented, Xu Lin will have his hands full.